Could 'Blood on the Tracks' fit with "Blood on the Leaves"? Instead of peace on earth and societal goodwill, the impending holiday season has so far only served up collaborations that nobody asked for — Kevin Hart and the Oscars, Lena Dunham and op-eds, 50 Cent with Eminem and Ed Sheeran, and now Kanye West and Bob Dylan. West, who has been noticeably less controversial since deciding to distance himself from politics, sought to get in contact with the songwriting icon on Twitter — not by tagging him directly, but by typing out his intentions and letting the universe do the rest. While the message doesn't explicitly call for a musical collaboration, it isn't as farfetched a thought as it once might have been. West's output with Paul McCartney was well-received, and work with another living legend would surely ruffle the feathers of aging rockists and younger Yeezy devotees alike. West's Twitter mentions were divided on the potential meetup, though fans have been comparing the careers of both Dylan and himself for years. While their present-day personalities may be drastically different, they are united in recent questionable fashion choices. 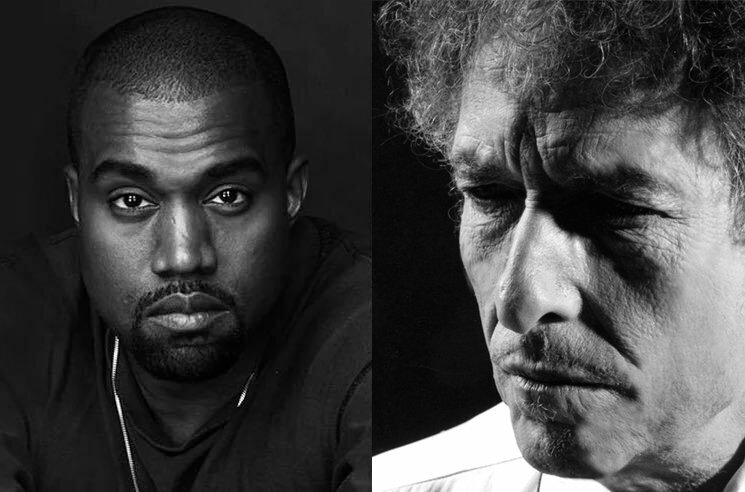 What would music from West and Dylan sound like? Could Blood on the Tracks fit with "Blood on the Leaves"? Could Dylan and Chance the Rapper help west expand "Father Stretch My Hands" into another three-album Christian trilogy? In any case, West is presently at work on an oft-delayed new album titled Yandhi. Don't forget to log off and enjoy get-togethers of your own this holiday season.